Congratulations to "Sally", the winner in Terry's giveaway. Thank you to all who participated! When I began writing my Blackthorne, Inc. covert ops series, the publisher didn't sign multi-book deals with new authors. When working with a publisher, they take care of all the details, providing editors and cover art. After I had my third book published with them, times had changed. They'd cut out their romance line, and I decided to go indie with book 4, Danger in Deer Ridge. This meant I had to hire out all the services normally provided by the publisher. But I'd already been working with a cover artist (The wonderful Dave Fymbo), and I asked him to design the cover for that book. These were the original covers for my Blackthorne, Inc. books. 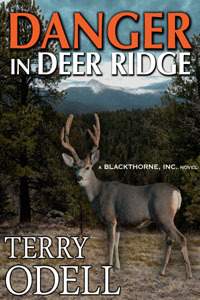 *Note: Danger in Deer Ridge's cover was NOT designed by the publisher. More on that later. Although I had nothing against any of the publisher-designed covers, they weren't "series" covers. Also, with the upsurge in e-books, and just plain on-line shopping for books, the challenge became designing a cover that looked good in a thumbnail-sized image, since browsing brick-and-mortar bookstores was becoming harder and harder to do. However, as time went on, I realized that it was more important to let readers know these books belonged together. 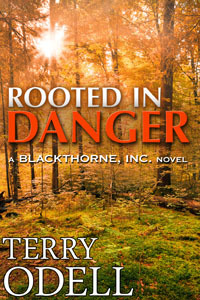 When the rights to Rooted in Danger reverted to me, I had my cover artist come up with an entirely different cover for the e-book, and using the fonts for my name and the title, connected it to Danger in Deer Ridge. Now I had two covers that "matched" and said "This is a series," but I still had two odd men out. It was easy enough to keep the art and simply change the words on the cover, so I decided to ask my cover artist to do that for me on the first two books. The results? Now, there's a "series" feel to the books. I think it works. What about you? Do you like looking at a book and immediately knowing where it "fits?" And, keep an eye out for Book 5 in my Blackthorne, Inc. series, which is currently with my editor. I'll be asking Dave Fymbo to design the cover for the new one, too. 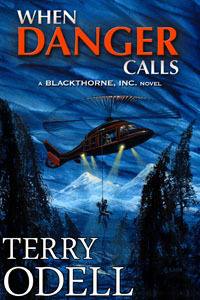 Terry will be giving away a digital copy of Danger In Deer Ridge to one person leaving a comment or email entry. Giveaway ends 11:59pm EST Aug. 10th. Please supply your email in the post. You may use spaces or full text for security. (ex. jsmith at gmail dot com) If you do not wish to supply your email, or have trouble posting, please email maureen@JustRomanticSuspense.com with a subject title of JRS GIVEAWAY to be entered in the current giveaway. The cover of a book is really important to me. Often it is the cover that draws my attention and gets me to pick up the book in the first place. I agree that that having the fonts match on each book in a series helps readers see that they are, in fact, part of a series. Covers are especially important with on-line browsing. They have to say "this is a real book" and they have to do it in thumbnail size. Thanks for commenting. I love the new covers for Terry's series - also love the books! They're so well written - impossible-to-put-down reads! I love the look of your covers, Terry. They do say "series" to me. I think it helps readers to be able to identify your product when similar styles/fonts/words are carried over to new products. Wishing you all the best with Book 5! You're rights, Maggie. What we're really "selling" is our name, so it's important that people can look at a book and immediately identify it as ours. Thanks, Jemi -- but you know, I'd be happy to send the prize to anyone you choose--you could give it as a gift if you won. Glad you like the series, and I hope you'll love Jinx's story. I like books covers that follow suit in a series, you've only got to look at my bookcase to easily spot the books that are in a series. I like your covers and look forward to reading them. Sally -- and I can look at my shelves and see when the publisher changed the cover styles in a series. It's good to be able to glance at a shelf and know exactly where to go. Hope you enjoy the Blackthorne team. I like books in a series to look similar. Sometimes Amazon does not tell you that a book is part of a series. So, I end up going through all of the books because I prefer to read books in a series in order. Good luck and keep the series going! Thanks, Marijane. Although there's a slot to fill in the series name when you upload a book to Amazon, it doesn't always get onto the product page. I think Barnes & Noble does get it there. I try to make sure my website shows which book is which (but I also try to write them all as stand-alones, so you can read them in any order.) Thanks for commenting. It's very important that books that are part of the one series have that look of belonging. Thanks, Mary - I agree. And at least I could change the covers for the digital versions of my Blackthorne books. I love seeing the evolution of things like this. Thanks for sharing! Thanks, Natalie--when a publisher handles the art work, they're the only ones who see what goes on behind the scenes. Authors simply get the finished product with very little input. Most of the time, it's "If your name is spelled right, that's your cover." I am much more likely to buy books if I know they are in a series. I read A LOT, and I love to find good series to read. If it is stated on the cover, I am one happy camper!!! Thanks for sharing your experience!! Mandy - I love series as well--especially when I love the characters. Thanks -- that was my goal. Guess it worked! I know what you're talking about, Pat. I tend to scan the list of covers and author names together--if I see a familiar author, that will pull me in before the cover does. I think covers are important, especially when they're at the extreme, A great cover can sway you to checking out a book you may be on the borderline about. A really bad one can dissuade you from getting one you might find you love in the end. Bottom line, it can make the difference between someone reading your book or not. I know it's been that way for me many times. Yes, even though it's the words between the covers that matter, a cover that attracts readers and gives them an idea of the genre is important. The cover and the title do matter. When I see the title, the cover has give that imaginary of what the title said. There are times I look at the title and the book cover doesn't match. Thanks, Kai - good point. The title should give the reader an idea of what kind of book it is, and working together with the cover can help that happen. I like the way the series covers follow a distinct pattern. I've been using Goodreads.com to follow series order. It is a great resource. It only takes one time to read out of sequence to ruin the earlier book in some series. Glad to hear yours can stand alone. Karen - I hate reading spoilers when I find a book I'm not aware is part of a series, so I work hard to make sure my books can stand alone. Also, my website has pages for each of my series, and I show the order of books.